“If there is a single species on this planet who will test our own mettle as humans, who pushes us to understand instead of judge, to study instead of kill, to coexist instead of dominate, to become more thoughtful and less fearful, it is the coyote”. 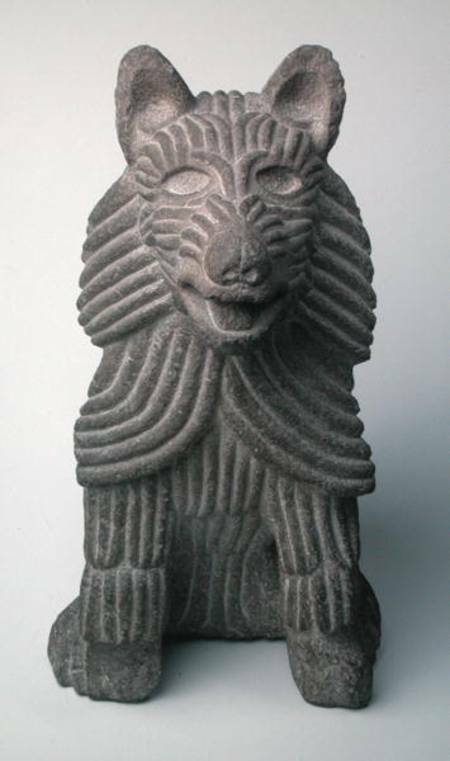 The ancient Aztecs of Mexico named our native wild dog, Coyotl a word of significant and reverential meaning in their native language of Nahuati . The Spanish who invaded Mexico, adapted it to be just like the original but they pronounced a long e at the end instead. And so their name has been passed down to us as Coyote. Coyotes have lived nowhere else on the planet, except North and Central America, and they have survived and thrived here for over a million years! Archeological digs have found the ancient remains of Coyote from New Brunswick to California. So it appears that Coyote has possibly been trotting about all over our American continent, adapting to the myriads of changes that have taken place on the earth all this time…long before our species found its way to the American continent. 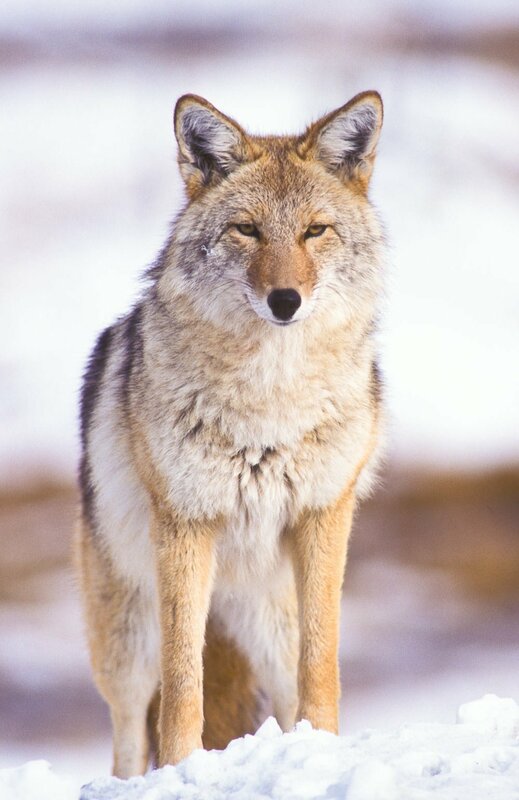 However, when the Europeans came to North America, Coyote was found only in the central grasslands, anywhere from present day Illinois west to the Rocky Mountains, north into Alberta Canada and south through Mexico. 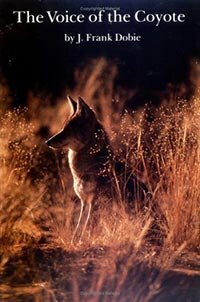 Frank Dobie in his classic book, The Voice of the Coyote, relates that when the first Europeans met Coyote they found that this prairie wolf, as they called him, had no fear of them. This attests to the relationship our Native Peoples had with Coyote ~ one of mutual respect and understanding. Fear was not the basis of their relationship, and therefore Coyote had no reason in those first encounters to fear the Europeans. Coyote also shared the land with fellow wild canines, the wolf, and fox. These carnivores lead complex social lives, with strict parameters regarding behavior within their immediate family and toward the other wild canines. Territorial defense plays an important role in population regulation and survival among carnivore species and within a species itself. So before Europeans came to our continent, wolf, coyote and fox kept each other’s populations in balance by means of territorial defense. But after our European ancestors slaughtered the entire wolf population of the lower 48 states by the mid 1920s, large areas across the continent where wolves once lived, were then open for coyotes to inhabit. As a result, coyotes expanded their range throughout North America. But not without enduring their widespread slaughter ~ poisoned, trap, shot and tortured, both by the federal government’s predator control and private individuals today. But they are so resilient. They adapt to drastic change, including the disruption of their social lives, and so they survived. As mentioned earlier, Paleontologists have found the remains of coyotes in cave deposits and in some Native American village sites on the east coast dating from the end of last Glacial Period up to a thousand years ago. Therefore this native wild canine, in fact, has returned. Maine’s historical Keystone carnivore, the wolf, has been absent for 150 years from our ecosystems, and as a result our landscapes have become impoverished, often in ways we cannot observe. With the return of Coyote, a Keystone carnivore now resides in the landscapes of Maine once again. And the more stable our coyote population becomes, the healthier our landscapes will be. To give you just a little idea of the mass slaughter of carnivores and their prey that took place, 80,000 wolves were poisoned, trapped, shot and tortured in Northern Montana alone between 1882 and 1918. Also 31,000,000 Bison were slaughtered between 1868 and 1881. Bison were an important prey of the wolves. Coyotes have a rich and complex social structure that is always alert to environmental restraints. This allows them to be flexible ~ by living as a lone transient, living on a territory alone, or living in a tight knit family. The second reason they howl is to communicate with each other when they are distances away. You will often hear more coyote howling in late Summer and early Fall, as this is the time when the coyote parents are allowing their pups to explore their territory a little more on their own. So the parents will stay in touch with their pups by howling. The third reason they howl is to announce to other coyotes that this is their territory. So coyotes in neighboring territories KNOW who their neighbors are, and that they do have neighbors who will defend their own territories. Dispersing coyotes also understand and respect these territorial communications. Thus, coyotes have no need to embattle each other; they are highly socialized in this regard. Visit the Beaver Pond below and listen to the Coyote family howling. Coyote families are made up a pair of mated adults and their offspring. In addition, there can be other family members who are not involved in breeding, but who are very much involved with the care and safety of the pups. Coyote’s use their home ranges to meet their daily needs, and they may overlap with the home ranges of neighboring coyotes. However coyotes territories, which are part of their home range, are defended and do not overlap. The size of a coyote family’s home range and territory is dependent on food availability. Generally, in rural areas they are larger in size, and in more urban areas they are smaller in size. In comparison, a solitary coyote can have a very large home range. Coyotes practice strict birth control. Under stable conditions, female coyotes often do not give birth until their fourth year, and by the time they are six, they will tend to be less fertile. In late January mid February, ONLY the alpha female mates with the alpha male. She is fertile for a short period of time once a year for about three weeks, and gives birth to her pups in April or May after a 60-63 day gestation period. Under stable conditions, a coyote family will maintain their territory and not permit other coyotes to enter. In this setting the alpha female will tend to have around three to six pups that are fed from food available only from their territory. Only 30% of the pups will survive to their first year, many dying from starvation, disease, and predation by terrestrial and avian predators. When coyotes are heavily exploited by humans, the stable family disintegrates, as well as their territorial defense. 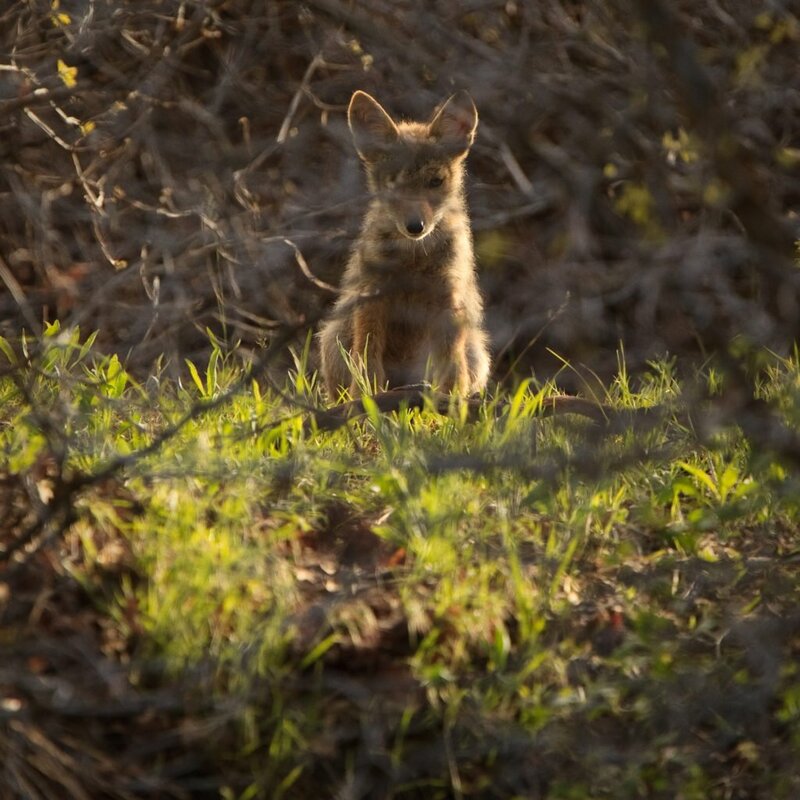 In this situation, often young coyotes that are only yearlings will have pups. 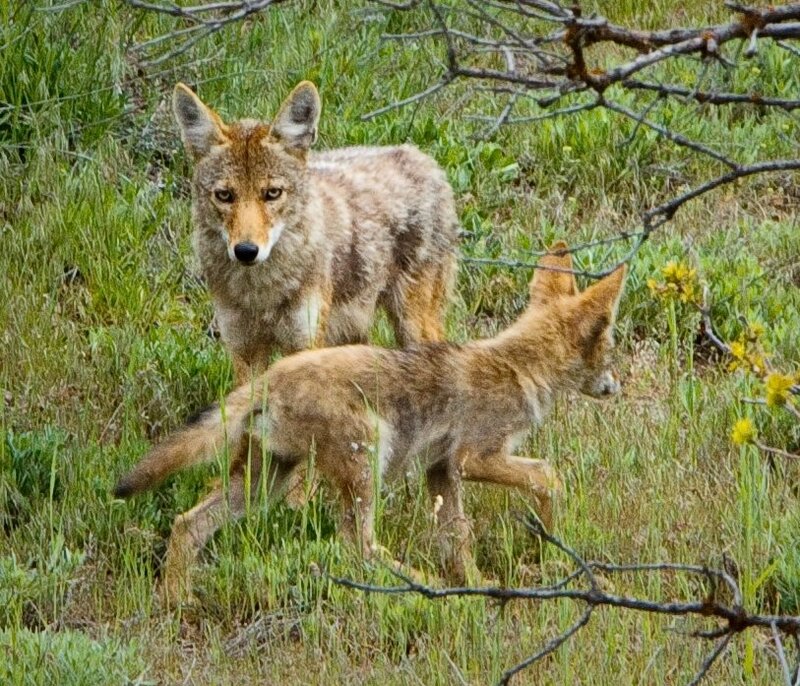 Very young coyotes have difficulty being effective parents to their pups, who need to be taught all the complexities of survival from their parents. 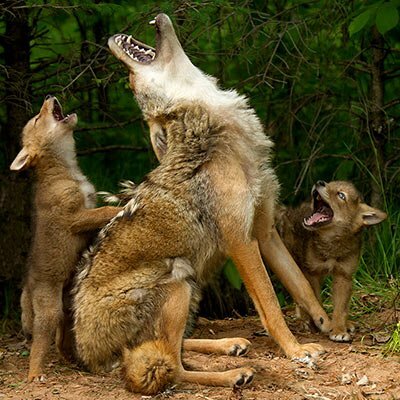 Coyote families are very sensitive to the disruption of their close social relationships. When an alpha female or male is killed by humans, the family may break up and disperse, or temporarily go into a chaotic state. As a result, the young, inexperienced members of the family, who are not adept at hunting as yet, may starve to death or come into conflict with humans in their search for food. Coyote activity patterns and hunting of their wild prey are also heavily influenced by human behavior, especially persecution and exploitation. Where coyotes are heavily exploited, they will tend to hunt limited wild prey at dusk and early morning, and will refrain from hunting diverse prey during the day, thus affecting the coyote’s positive influence in the ecosystem. Coyote’s diet is diverse, and changes with the seasons, depending on food availability. This is one of the major reasons why coyotes are so successful as a species. 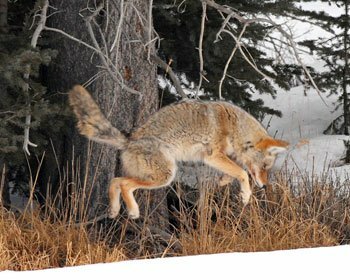 In late Spring and Summer, coyotes seek out snowshoe hare, diverse species of rodents, insects like grasshoppers, raccoons and, wild turkeys, Canada Geese, just to mention a few choices in their diet. From mid May to mid June, coyotes along with bears seek out newborn fawns, an important role they play in keeping our deer herds healthy and their numbers in balance. In late Summer and early Fall, coyote’s diet is almost exclusively berries: blueberries and raspberries being their favorites. But rodents are always on their menu. In Winter and early Spring when the snow is deep, coyotes survive on wildlife that have succumbed to the cold or starvation. This includes the many deer mortally injured by hunters who were not able to retrieve them, those injured by automobiles, those who are starving or diseased, as well as deer not capable of escaping due to deep snows or slippery ice. Snowshoe hare are also a primary food in the winter. And rodents are never off their menu, particularly when snow melts due to intermittent thaws in the weather. 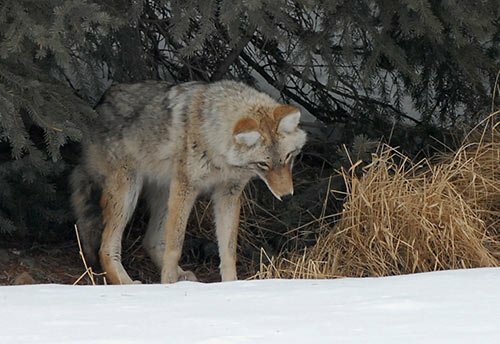 All this said, Coyote’s wild diet remains diverse all year, depending on the weather, snow cover, climate change, landscape changes due to human intervention, and availability of their prey. Know too that starvation is an ever present companion in their lives. We want Coyotes to remain WILD … and fulfill their important role in the ecosystem. As the Keystone carnivore here in Maine and the eastern United States, coyotes have a positive effect within the ecosystem, balancing populations and preventing the spread of disease, and by doing so supporting biodiversity on the landscape. Whenever wildlife populations are higher than nature meant for them to be, disease becomes a serious issue. So carnivores, like coyote, keep wildlife numbers in balance and help prevent such diseases as wasting disease in deer and rabies in raccoons and foxes. Our species is positively affected by coyote’s presence in more than one way. For example, the bacterium for Lyme disease is carried by wild rodents that infect the ticks that often feed on our deer population. By keeping the deer population in balance, the tick population does not explode. That will limit the number of ticks that can be infected with the Lyme disease bacterium when they bite a wild rodent. In addition, wild rodents are one of coyote’s primary foods, thus keeping their populations in check. Nest success of ducks decreases due to the increased presence of red fox, who are known to be heavy predators of duck eggs. Decrease in the diversity of songbirds due to predation by raccoons and large numbers of domestic and feral cats. Declines in partridge and grouse again due to increased presence of red fox. So in order to understand Coyote’s important role in the ecosystem a little more, let’s touch upon the function of predator prey relationships in sustaining biodiversity on our planet. 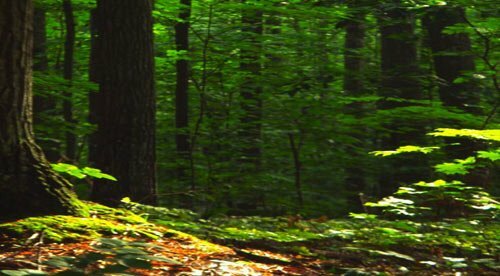 To start, what is “biodiversity” anyway? Actually, the word itself tells us ~ “bio” and “diverse” ~ life that is diverse. And why is it so important, and what does it have to do with our lives? The complex diversity of life on our planet is what keeps our planet resilient, healthy and dynamic. And this affects us in our everyday lives, from the diversity and balance of organisms in your gut, to the food you eat, and on and on. Our organic farmers here in Maine know so well that growing monoculture crops year after year in the same place is an invitation to disaster for them. That lack of diversity will quickly invite insects who will devour all their hard labor, and there will be no back up of other plants that can withstand or hold off the insect invasion. So here is a powerful historical example of the disaster that can happen due to lack of diversity ~ the Potato Famine in Ireland. The Irish grew ONE, and only ONE strain of potato, and when that strain of potato was infected by a fungus in 1845, one million people died of starvation. Had they planted with some diversity, this tragedy would not have happened. Let’s take this whole concept into the larger ecosystem of our planet and its diversity. When you walk through a natural ecosystem, what do you see? And what is it that you do not see? Often there is little comprehension of the immense changes to a landscape due to ecosystems dominated by herbivores (ex: moose and deer) and mesopredators (ex: raccoons, skunks, fox). And why? … because it was long ago that a shift in large predator presence occurred. So we do not have a relevant baseline to observe or measure biodiversity. In fact, behavioral changes in herbivores due to predation pressure can be as significant as direct predation. That is, the very presence of a top carnivore on the landscape affects the behavior of the herbivore. They don’t stay in one place too long, they make different choices of where they will feed, and how many of them will congregate together. An example of this ~ one of our Maine farmers related to me that deer and coyotes live on his farm. Before the coyotes included his farm in their territory, the deer were insatiable, eating his crops without reserve. When the coyotes settled in, the deer knew of their presence, and their behavior changed. No more hanging out in his garden all night. A few bites and they moved on, knowing that staying in one place made them more vulnerable. But we do know that biodiversity is a matter of dynamic processes and interactions, as well as species diversity. So when species are lost, the species interactions are lost as well. The functional loss of apex predators cascades down to the loss of species at lower trophic levels, and thus the loss of large carnivores can have far reaching effects on the functioning of an ecosystem. It is like taking the conductor from an orchestra! … the music falls apart. When herbivore populations are unchecked by predation, they have the ability to denude landscapes, and carry the threat of succumbing to epidemic diseases. That denuding of the landscape can be the beginning of the end of biodiversity on that landscape. The predation pressure placed on herbivores by apex carnivores influences their density and behavior, thus strongly effecting their habitat selection and feeding decisions. The result of this causes profound effects on the structure of ecological communities. It has been found that even though one or two predators have the greatest impact on prey populations, that predator guilds of up to five carnivores may be necessary to promote ecosystem function and biodiversity. 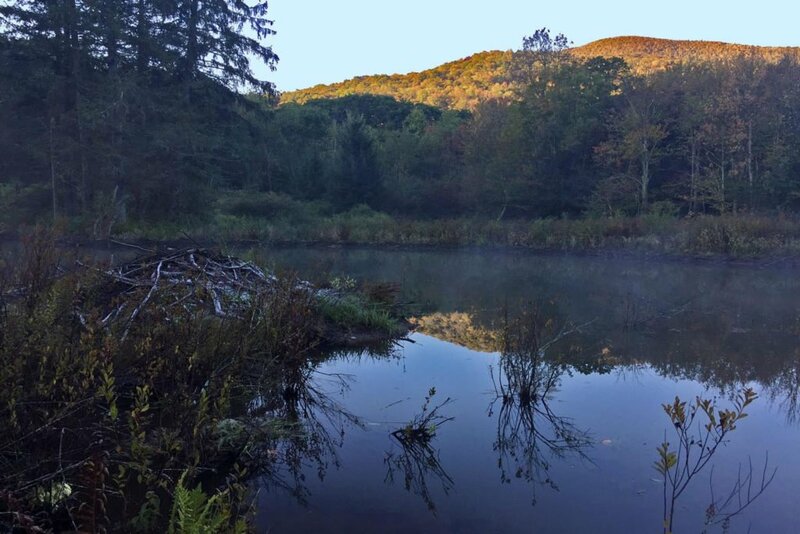 And this is where large heterogeneous landscapes play a crucial role in biodiversity here in Maine, as varied carnivores may have diverse landscape needs, and require connectivity in order to disperse and share their genetics. In conserving these landscapes, we need to minimize the gradients between reserves and human use, and humans need to be integrated into the process. 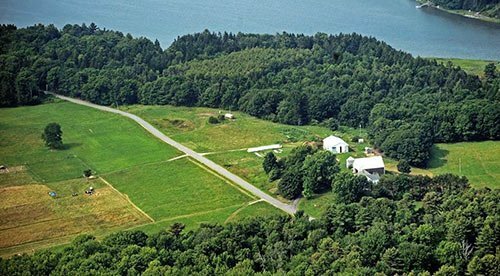 The ongoing efforts to preserve the large landscapes of our farms here in Maine, is an example of this. It is known that large carnivores generally do not need pristine conditions, as many of us have come to see, living with Coyote. But what truly effects their distribution and abundance is security from human conflict and freedom from human exploitation. And this is the challenge for our generation. In order for this to happen, the support from a better educated public will be required. In the wisdom of Nature, the predator is not separate from their prey, they are a single organism, that is dynamic and ever adapting to life on earth. Through our perspective we have separated them, and thus have lost sight of how these two beings create the whole. So I would encourage you to practice looking through the eyes of Nature. Unsurprisingly, our young children do this very well.